The non-refundable rate will be charged at the time of booking, and the amount will not be refunded in case of cancellation. The standard rate will be paid at the arrival of the hostel, and it can be canceled free of charge, up to 48 hours before. In case of no-show, or cancel out of date, the first night will be charged. Reservations of 2 or more rooms and reservations for more than 12 guests may be subject to different conditions and may have additional charges. 10 EUR deposit will be requested at check-in per person, which will be returned at check-out in case of no damage. 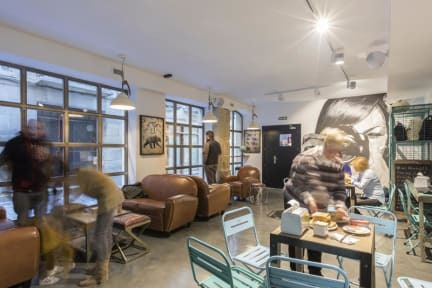 Winederful is a unique hostel with charm, in the style of the best hostels in Europe. It is located right at the core of Logroño’s Old Town in which art, culture and of course gastronomy come together. Rooms are complete with a private bathroom equipped with a shower, while at Winederful Hostel & Café guests are also provided access to a patio. We are located in an unique are of Logrono, near to some of the finest attractions and landmarks of the city such as Puente de Piedra, Casa de las Ciencias, the Cathedral, Puerta del Ebro, Museo de La Rioja and other relevant spots that you can find in our city. All the rooms are equipped with private bathroom and other amenities to bring a fantastic experience to our guests and travellers. In addition, we have free Wi-Fi network across all the premises of our property. In our dorms, you will be able to find bunk beds with curtain to have more privacy as well as reading light, socket and personal locker with safety lock. 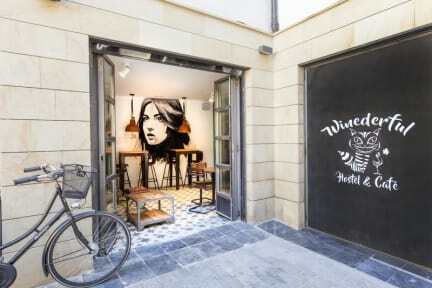 Best place to stay in Logrono. Everything is clean and tidy and well prepared. The common spaces are good, as well as the cafe. Very cute hostel in a perfect central location. Clean. Accommodating, kind, and fluent in English staff. Coffee and croissants were great in the morning! Easy walking to everywhere in Logroño, and very patient and easy to understand staff members who helped with directions and bus schedules. I moved from LA to Spain but as far as I’m concerned I consider this place my first home here in Spain. I was treated well by the staff, was given a clean (pretty) comfortable bed, and relaxed in the very nice common area. I HIGHLY recommend staying here! It’s close to the city center and the nightlife, the area is safe, and you get to meet all the incoming people staying for the Camino de Santiago. Stay here! This was a great hostel with friendly staff, in the middle of a walkable city, very close to many lovely sights, including churches and wine bodegas. There were drawers under the bed that were lockable with your keycard, which was great, but if you didn't put everything in your drawer it might not be there when you got back - I left my water bottle on my bed during breakfast and came back to it missing, and my roommate's ibuprofen was also taken off her bed. But overall, would recommend! Staff is amazingly nice and so pleasant. It's great for a quiet getaway. This is a wonderful hostel with excellent staff in a brilliant location. The beds are very comfy and it feels very safe. As the city is on the Camino de Santiago route, lots of the guests were hikers who just wanted a quiet night’s sleep, and so it was not much of a sociable / party hostel at all, more of a quiet place where you can have the odd friendly chat. But, the bar is good, and overall it’s great. Excellent reception staff. Very welcoming and helpful. Nicely designed hostel located centrally in Logrono.